Information You Provide to Us: We may receive and store any information you enter on our website or provide to us in any way. This may include your name, nickname, email address, mailing address, password, telephone number, date of birth, photos, gender, shopping, price and brand or size preferences, purchase and return data, and any other information you provide in your profile or registration or otherwise provide to us, such as when ordering a product (which may include your credit card and related information), entering a contest or sweepstake, filling out a survey, writing or commenting on the site or app, providing feedback, requesting information, applying for a job or submitting an affiliate agreement or sending messages or performing searches. Logging in Via a Third Party Site: We collect information when you register to join our Services by logging in via an account that you already have with a third party social network site ("SNS") such as Facebook, Google, or Twitter. For example, our Service may allow you to create an account and login to the Service using your Facebook account credentials through Facebook Connect. If you create your account using your SNS credentials, you are using the personal information you provided to the SNS (such as your name, email address, and other information you make available via the SNS) to create your user account on our Service, and, with your permission, may enable us to access additional information to enable us to enhance and personalize our Service to you; the information we receive and collect may depend on the privacy settings you have with the SNS, so please consult the SNS's privacy and data practices. You can choose not to provide us with certain information, but then you may not be able to participate in or utilize the activity or Service, such as receive email alerts, post comments to our websites, create a user profile, perform searches or queries, send messages, purchase products or services, or communicate with us. Automatic Information: When you interact with us, we use technological tools such as "Cookies," "Log Data," and other identifiers to receive and store certain types of information whenever you interact with our Services, including our Website or advertisements and other content served by or on behalf of Fashwire on other sites. Examples include your IP address, unique device identifiers, session ids, computer or mobile device make and model, operating system, browser program and version, pages you requested, shopping and purchase preferences and history. We may use this data to, among other things, tailor, customize and enhance our products and services as well as your experience with third parties (as provided in Section 2), and to help diagnose, operate and administer our Services. Our Service may automatically collect usage information, such as the numbers and frequency of visitors to our Websites and their components. This data is only used in the aggregate, that is, as a statistical measure, and not in a manner that would identify you personally. We use this information to design and improve our Services, and may provide this information to partners so they can understand how often users use areas of our Websites. When you visit our Websites, we, and/or our authorized Third Party Service Providers and Advertisers, may automatically collect certain information, such as the URL of the website you visited prior to or after visiting our Services, through the use of electronic tools like Cookies and Web beacons or Pixel tags. We use Non-Personally Identifiable Information to troubleshoot, administer our Services, analyze trends, gather demographic and retail preference information, enhance and customize our Services, measure the effectiveness of our online advertising, content and programming, comply with applicable law, and cooperate with law enforcement activities. We may also share this information with our authorized Third Party Service Providers, Retailers and Advertisers for these purposes. We may also publish this information for promotional purposes or as a representative audience for Advertisers. Email Communications: We may receive confirmation via HTML code when you open an email from us, which helps us measure our Services and ensure reduce or eliminate duplicate e-mails. If you no longer wish to receive promotional e-mails from us, please unsubscribe or change your profile settings. We will need to continue to send any administrative or transactional e-mails, such as regarding purchase transactions. Tell or Refer A Friend or Buy For a Friend: If you use our referral service to refer Fashwire to a friend, or buy a deal for a friend, we will ask you for your friend's name and email address. We will automatically send your friend a one-time email inviting him or her to visit and join Fashwire or with the gift you bought for them, and notify them that you are a member. We store the friend's information for the sole purpose of sending this one-time email, sending their gift, and tracking the success of our referral program. If you choose to participate in our referral programs, you represent and warrant that you have a personal relationship with your referral and that you are authorized to share their information with us for the purpose of sending this communication to invite them to join the Services. If you believe that one of your contacts provided us with your Personal Information and you would like to request that it be removed from our database, please contact us at support@fashwire.com to request that we remove this information from our database or use the "unsubscribe" function in the e-mail to block future invitations. Information from Other Sources: For purposes such as improving personalization of our Service, we may receive information about you from other sources and add it to our account information, including details of the purchases (and any associated returns) you make at retailers where you were referred by us (excluding any credit card information). Mobile Applications: If you access our Services via your mobile device, we may collect or receive information that uniquely identifies your device (unique device identifiers or UDID, MAC address and IP Address) and other information you may choose to provide, including email address, geo location or email address, or information you approve, such as accessing your contacts to enable you to invite friends to join the Service. In addition, in the event that our Mobile Application crashes on your mobile device, we will receive information about your mobile device model, software version and device carrier, which allows us to identify and fix bugs and otherwise improve the performance of our Mobile Application. Will Fashwire Share Any of the Information It Receives? We neither rent nor sell your personally identifiable information to anyone. We share your personal information only as provided herein or with your consent, to the entities described below. Affiliated Business We Do Not Control (Such as specified Merchants and Retailers): We are affiliated with a variety of businesses and work closely with them. We provide Services or promote or sell products jointly with affiliated businesses and other business partners. You can easily recognize when an affiliated business is involved in your transaction. We will only share personal information that is related to such transactions or is necessary for the affiliate or business partner to complete the transaction. Agents/ Third Party Service Providers: We employ other companies and people to perform tasks on our behalf and need to share your information with them to provide our Services to you ("Third Party Service Providers"). Examples include sending postal mail and e-mail, removing repetitive information from customer lists, performing surveys, tracking clicks, analyzing data, administrative functions and website operations, providing marketing assistance, providing search results and links (including paid listings and links), processing credit card payments, and providing customer service. We may also provide your personal information to agents who will use it to verify aggregate usage data that we provide to our partners. These Agents may not use your information for any other purposes. Social Networking Sites (Sharing Information and Posting): In the event we allow Users to link their Social Networking Sites (e.g., Facebook, Twitter, Google or Pinterest) to our Service, we may share the information in your Fashwire account (including your Personal Information) with the SNSs that you link to your Fashwire account. These third parties have access to your Personal Information only for this purpose (unless the SNS has received your Personal Information independently of the Service) and not for other purposes. Users can then post recent activity on our Service back to their Social Networking accounts. You will be prompted to decide whether or not your activity on the Service will be shared and disclosed on your Social Networking accounts or services. You can disable the foregoing feature at any time by logging into your profile and selecting the option to disable such Social Networking account and feature. Further, you may be able to edit your privacy settings for the content that you post which appears on such Social Networking accounts by specifying such options when you create or edit your profile on the Service. Promotional Offers: We may send offers to certain users on behalf of other businesses. However, when we do so, we do not give the other business your name and address. If you do not wish to receive these offers, please notify us by e-mail at support@fashwire.com. Discussion Forums, Blogs and User Generated Content: The information you provide us in connection with your user profile or any content you post to the Website may be used to facilitate and provide your requested Services within the Website and/or your request for our services through other websites (such as if you request our assistance with a related merchant or retailer). Any personal information or content that you voluntarily disclose online (on discussion boards, in blogs, comments, messages and chat areas, within your public profile page including your profile picture, etc.) becomes publicly available and can be collected and used by us and others and may be redistributed through the Internet and other media channels and may be viewed by the general public. Communication About the Website or in Response to Your Requests: As part of the Website and our Services, you will receive email and other communication relating to your use of the Website or your user account. You acknowledge and agree that by posting information on the Website or otherwise using the Website, we and our agents may send you email, contact you or engage in other communication that they determine in their sole discretion relate to your profile or use of the Website. We may use a user's email address (or telephone number for text and multimedia messaging) to send updates, a newsletter or other news regarding our Services. Business Transfers: In some cases, we may choose to buy or sell assets or business. In these types of transactions, customer information is typically one of the business assets transferred. Moreover, if Fashwire, or substantially all of its assets, were acquired, customer information would be one of the assets transferred or acquired by a third party, and you consent to such transfer. As stated above, you can always opt not to disclose information, but then you may be unable to use certain features on our websites. As also stated above, we rely on your consent to use your information as described herein. You may withdraw your consent at any time by contacting us at support@fashwire.comor following an unsubscribe link in any marketing communication you receive from us. You can access your personal information on our websites and correct, amend, or delete information in your registration profile. To do this, you may login to your account and click "edit preferences" to view and edit your profile or contact support@fashwire.comand we can help you resolve anything you wish to change. Please note that certain administrative data cannot be removed, such as previous purchase and transaction history and any friends you've referred, and certain other information may remain in our records after editing or deleting your account information. If you would like us to stop tracking such data, please unsubscribe to the Service, by either clicking unsubscribe at the bottom of any email, logging in and unsubscribing from the Website or contacting support@fashwire.com. If you create digital content on or through our Website (such as reviews, posts, comments or a blog) you may delete that content, but if the content has been reposted on other sites by Fashwire or other users, it cannot be deleted. Users may post comments or post blogs. Such writing cannot be deleted. With respect to our mobile and other applications, you can prospectively stop all collection of information by the application by uninstalling the application and unsubscribing from the service using the methods above. You may request deletion of your Fashwire account by sending a message to support@fashwire.com. Please note that even after your account has been disabled, information may remain in our records after deletion of your account. To exercise any of these rights please contact us in accordance with the contact details set forth below in Section 8 below. Please note that if you are not subject to EU law, these rights do not apply to you. We take security seriously and take numerous precautions to protect the security of Personally Identifiable Information. You can access your Personally Identifiable Information on our Website through a password and your email address. This password is encrypted. We recommend that you do not share your password with anyone. In addition, your Personally Identifiable Information resides on a secure server that only selected personnel and contractors have access to. Certain sensitive information, such as purchase and credit card information for purchases made through our site, is transmitted using Secure Socket Layer (SSL) technology to ensure that your Personally Identifiable Information is safe as it is transmitted to us. We endeavor to protect user information to ensure that the user account information is kept private, however, unauthorized entry or use, hardware or software failures, and other factors may compromise the security of user information at any time and no data transmission over the Internet or any wireless network can be guaranteed to be 100% secure. As a result, while we employ commercially reasonable security measures to protect data and seek to partner with companies which do the same, we cannot guarantee the security of account information transmitted to or from the Website, and are not responsible for the actions of any third parties that may receive any such information. For more information about the security measures we use in connection with the Website, please contact us at support@fashwire.com. Does Website Collect Info from Children (U13)? Our Services are not intended for children under the age of 13. We do not knowingly collect or solicit personal information from anyone under the age of 13 or knowingly allow such persons to register. If you are under 13, please do not attempt to register for our websites or send any information about yourself to us, including your name, address, telephone number, or email address. If you believe that we might have any information from or about a child under 13, please contact us at support@fashwire.com. 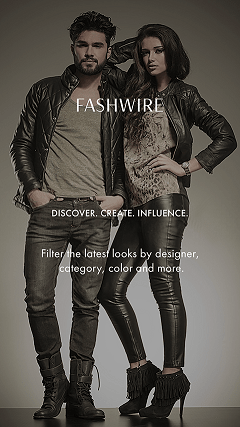 Fashwire does not sell products for purchase by children. In certain instances, we sell children's products for purchase by adults. Mail: Attn: Privacy Officer, Fashwire, Inc. 3308 West McGraw Street, Seattle, Washington, 98199. Should you contact us by any of the above means, please provide sufficient information for us to identify your account. Your privacy is important to use, and we will make every effort to resolve your concerns as soon as reasonably possible.